American Muslim Health Professionals (AMHP) is a national non-profit organization dedicated to empowering Muslim health professionals to advance public health, social justice, and civic engagement within their communities. AMHP’s focus is on professional development, health promotion centered around the unique needs of American-Muslims, and advocacy for minorities and underserved communities. AMHP has held numerous sold-out networking events in various cities across the country including Chicago, Washington, DC, New York, and Detroit. The networking luncheon will provide an opportunity for professionals and students to collaborate and share ideas for projects and activities to improve the health status of our communities. AMHP is a 501(c)3 non-profit organization. Dr. Hamza Shaikh, MD joins Cooper University Health Care Neurological Institute from the Hospital of the University of Pennsylvania in Philadelphia, Pa, where he completed a neurointerventional radiology fellowship. 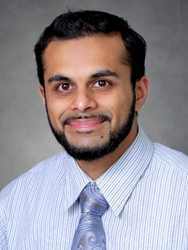 Dr. Shaikh also completed a neuroradiology fellowship at the Hospital of the University of Pennsylvania. He completed his residency at the Robert Wood Johnson University Hospital in New Brunswick, NJ and his internship at Lehigh Valley University Hospital in Allentown, Pa. Dr. Shaikh received his medical degree from Robert Wood Johnson Medical School. Dr. Shaikh is a member of the Radiological Society of North America, the American College of Radiology, the American Society of Neuroradiology, the American Roentgen Ray Society, and the Pennsylvania Radiological Society.